You can not always have an opportunity to place dispatchers (operators) where your radio (transceiver) will work in the best way. Office may be located on the lower floors of buildings, or in the area that failed to locate radios and antennas, or in the zone of strong interference. Hams also can not always stay close to their transceivers at the right time. Sometimes it is necessary to arrange the audio device (intercom, etc.) away from the operator workplace. There is a single solution for all of that issues! You can place the people where they feel more comfortable, and place the radio (audio device) - where it will work as it should. 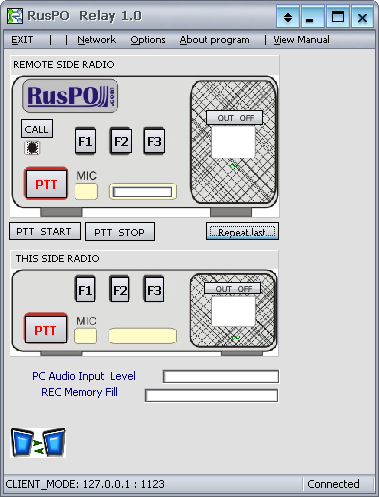 And then you can connect them via a computer network, using RusPO Relay as flexible, versatile and reliable solution for radio professionals and hobbyists. Beginning from version 1.10 there is an opportunity in the software to play into air the periodic promotional information or sound clips. This feature can be used for speakerphone or other audio devices to play media. And also it may be useful for transceivers to be used as radio beacon, or to periodically broadcast a call sign to air (if it is permitted by local law). Intellectual system hears the air and avoids transmitting if channel is busy (polite mode). The program has low requirements for computer and network resources; it even was tested on GPRS/EDGE and dial-up modem connection. The program has a subsystem that monitors the quality of connections and restores the connection after the breakage. We use an original method of audio compression, so the consumption of internet traffic is reduced to the minimum necessary. We provide a variety of options for connecting the audio device or radio to computer, for convenience and versatility. At a minimum, the device can be connected only to the Mic (Line in) and Speaker (Line out) audio subsystem terminals and can use voice activation (VOX) for switching modes (reception and transmission). To get all network abilities you need at least two copies of the program installed on two computers. The device (radio) can be connected to a "server" computer or to a "client" computer. Some particular aims like ads transmitting require only one program copy and one PC. If it is impossible to obtain a real IP address for "server" mode, please contact our tech support -- there is a "remote repeater" solution for affordable fee. to control a remote audio device, transceiver, walkie-talkie, etc. to establish a direct and permanent audio channel between two points (computers). to private voice communications over a network in a mode of "point to point"
to control audio devices such as intercoms, etc.